Among several notable intuitions, pianist and composer Veryan Weston has been working for decades on the concept of tessellation. To quote from his website, "visual interlocking symmetries and geometric shapes are transferred to the audible world of pitches, rhythm and counterpoint, with the spirit and energy of jazz, improvisation and folk music always at the heart of the performance". 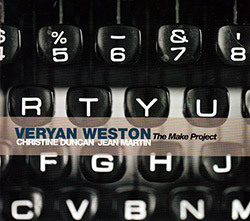 Nothing rings truer after having lent our ears to this brilliant album, in which Weston presents the newest version of an existing work with the help of vocal conductor Christine Duncan and drummer Jean Martin. Other musicians involved are Felicity Williams and Alex Samaras (vocals), Jesse and Josh Zubot (violin), Anna Atkinson (viola), Andrew Downing (bass and cello), plus two vocal ensembles: Hidden Meanings Voices � a tentet � and The Element Choir, a unit featuring 45 improvising singers. The aforementioned creative tool is especially highlighted in the 32-minute "Tessellation IV � Make". Instruments and voices generate a somewhat Wyatt-esque patchwork of stratifications, ramifications, vacillating chordal structures and, in general, luminescent humanity. The whole revolves around selected phrases by activist women, linked by the presence of the word "make". Beyond the meaning, these excerpts create an impressive rhythmic complexity not deprived of unadulterated melodicism. Across the extended duration, relinquishing any pretense of "studying" helps a listener to a better enjoyment. The acoustic architectures retain an implicit clarity that made us feel at home throughout, at the same time able to discern the individual sensibilities of the participants. The preceding shorter chapters � "Hidden Meanings" and "Hidden Words" � act as preambles of sorts, but are equally essential to complete the experience. The former is typified by Reich-ian scents immersed in Canterbury currents (a characteristic that is also typical of the longest episode), whereas the latter is an entirely instrumental chamber jazz excursion that balances a reverberant conciseness and an unassuming virtuosity. It's difficult to detail in a review the myriads of expressive subtleties and the sheer aural gratification derived from a plunge in these transparent waters. While Weston's pianistic value is renowned, for some reason he appears to be slightly overlooked when listing the best of Britain in terms of compositional strategies. In reaffirming the Londoner's vision, this record ultimately suggests valid alternatives to aerials in search of relevant artistic signals.